Picking up where David left off on large-cap investing, this week I’m going to discuss some strategies we use to find investment opportunities for the Clime Smaller Companies Fund (CSCF). It’s not so much the individual company analysis but the screening process that’s slightly different. We’re seeking to exploit structural inefficiency at the smaller end of the market. Liquidity constraints shut out large institutional investors, meaning brokers have much less incentive to cover the segment, and so there’s generally less competition for returns. However, there’s over 2000 companies outside the top 50, and not only that, as a whole they have significantly underperformed over the last 10 years. With so many companies to review in the small-cap universe, and with numerous bombs to avoid, efficiently targeting the best ones for deeper research is arguably the most important part of the job. Unfortunately, because value is hidden in places others haven’t looked, one should be prepared to investigate as many companies as possible, one by one, in order to find something out of the ordinary. Ideally the best ideas follow a path of least resistance into portfolios. So the question is, how should the process be systematised? One way to start is by to categorising companies according to a set of factors that hint at a potentially improving outlook, but which also lie outside traditional quantitative screening (i.e. less conspicuous information). Below we discuss these factors and experiences in building the CSCF. Recognising the huge informational advantage of insiders, significant on-market trading by company management or directors often signal changes afoot that are yet to be understood by the market. Insider activity can be a very useful contra-indicator, particularly when the market’s pessimistic. Recently, significant director buying aided our decision to invest in IMF. IMF is one of the world’s most experienced and successful litigation funders. Since it was established in 2001 IMF has completed close to 200 cases with a 90% success rate. A downside to the business, however, is the unpredictability and lumpiness of its earnings as a result of the size and timing of big cases. Perhaps due to this lumpiness, mid last year IMF was trading at around $1.00, which was a substantial discount to fundamental value. Our sum of part valuation was $1.71, which was the aggregate of net cash per share ($0.71) and the value of IMF’s case book ($1.06). It was also well below Clime’s multiple to equity valuation of $1.76. Our view was vindicated by insiders, when Chairman Michael Kay and MD Andrew Saker purchased $400k worth of stock between March and April. As could be expected, Kay and Saker were on the money, and now the IMF trades comfortably above $2.00. Often quantitative screening tools are based on bottom line earnings and cash flows, for example EPS growth, ROE, P/E and EV/EBITDA. But these metrics can be deceptive when companies have distinct segments contributing to the bottom line. Here’s a question: what would you pay for a business that has earned nothing for the last couple of years and is likely to continue to do so for the foreseeable future? Not much at all would be a logical answer without any further information. A fault of some simple quant screens is that investors to implicitly make this conclusion by filtering out these companies too soon. Therein lies the value of visiting the notes of annual reports to see whether offsetting segments are feeding the Group profit line. For example, if a zero net profit figure is made up of $10m from a growing segment and a -$10m loss from a start-up or declining segment, the business is likely worth well over $100m+, assuming management could simply shut down the loss making division. While this is all very obvious, in our experience masking between divisions contributes to mispricing often enough that it’s one of our first points of call. Divergent segments was how Jumbo Interactive (JIN) and RPM Global (RUL, discussed next), both held in CSCF, were first brought to our attention. A more recent example is Nearmap (NEA), which is interesting but not yet held on valuation grounds. As shown in the segment note from its FY17 annual report below, NEA’s $5.3m loss was generated by a $21m operating profit from the Australian segment, offset by a $13m operating loss in the United States (note these figures are before corporate costs, foreign exchange effects, and tax). What’s interesting is NEA’s market cap is $240m. Adjusting for $37m net cash, the enterprise’s market value is about $200m, which represents a modest multiple of 10 times Australia segment EBIT. We can also see that the Australian and US segments have very similar cost bases – operating expenses were $15m in Australia vs $17m in the US. However, the Australia segment generated much more revenue – $36m vs $4m. Without knowing anything else about the business it’s clear NEA is pre-investing in US start-up operations, and that if this segment can leverage costs in the same way as Australia, it may one day generate comparable or even higher earnings. If this were to eventuate, Group EBIT would be $40m+ (all else equal), and today’s share price would look very cheap. At this stage NEA looks neither cheap, nor expensive. In Australia the company’s unique subscription billing model supports a near-monopoly position. However, the US is more competitive and there less awareness of the benefits of subscription-based photomapping. In particular, the US incumbent, Eagleview, recently entered a technology partnership with ASX start-up Spookfish (led by former NEA engineers), which will boost EagleView’s photocapture efficiency to similar levels as NEA. The key risk is NEA’s significant investments in US sales and distribution fails to drive sales, and in our view the share price doesn’t quite compensate for this. Identifying compounding growth before it’s in the numbers or before the market discovers it is one of the holy grails of investing. Low penetration within a large market can signal significant growth potential, so it’s something to make note in the screening process. The first was the large market opportunity. RUL’s mine planning and equipment maintenance software is the only solution with full SAP enterprise system integration and certification, allowing master data – a single source of truth – to flow between Corporate and Operational levels. This enables remote resource planning and scheduling, and better coordination, which saves time and money. To get a sense of the untapped opportunity, there are about 100 listed miners globally with revenues above $1bn, almost all of them use SAP for their corporate ERP system, and although many already use RUL modules, Glencore is currently the sole Global Enterprise Framework customer. RUL is in many ways a ‘build it and they will come’ type of business, but we think it should experience strong demand. According to McKinsey, software integration with mining operations could drive $370bn costs savings world-wide between 2015 and 2025 (17% of the total projected cost base), with operations management and equipment maintenance (RUL’s target area) being the key cost opportunities. The second was the criss-crossing trajectories of RUL’s Advisory and Software segments. RUL’s previous management pursued a consulting services strategy in the lead up to the mining boom, which of course quickly unravelled after 2011. In 2012 the current management team of enterprise software specialists took over and refocused the business on software. 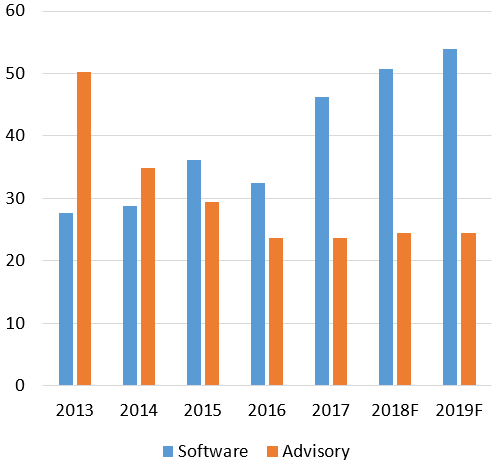 Until recently strong momentum within RUL’s software business was masked by the decline and restructure of the advisory business, providing an attractive entry price. The idea of a company using cash flow to paying down heavy debt doesn’t inspire – it doesn’t help to grow earnings in the short term and can make a business look like it’s stalling. However, as a business moves into a net cash position it becomes less risky and gains optionality, and occasionally this occurs precisely when the market is least interested. A good example is HFA, which we covered after it announced better than expected growth Assets Under Management (AUM). HFA spent a good part of the last ten years repairing its balance sheet following its debt-fuelled acquisition of Lighthouse Partners in 2007. 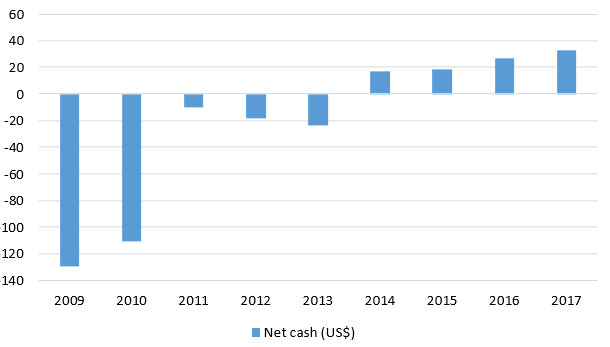 Most importantly, the transition from US$130m net debt in FY09 to US$33m net cash in FY17 was largely driven by internal cash flow. Also note the gap between reported profit and cash flow caused by write-downs and amortisation of customer relationships. On a couple of occasions in the last 12 months, HFA traded on a multiple of 7.5 times annual free cash flow. Effectively, this implied the business was expected to decline, using a 10 times multiple as the baseline for zero growth (i.e. 10% simple return into perpetuity). We thought this was peculiar for a few reasons, a primary one being that HFA had plenty of capital to put into growth projects. As it turned out recent investments in new distribution markets across Europe and Asia, enabled by its strong balance sheet, drove much of the AUM growth in the last 12 months.